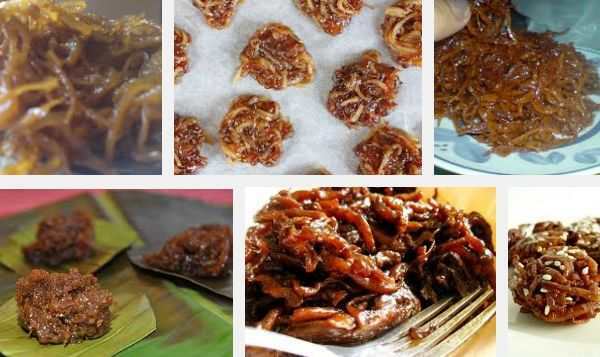 Bukayo is a very sweet Filipino delicacy popular among children. It is simply made by simmering strips of young, gelatinous coconut (buko) in water and then mixing with white or brown sugar resulting into a sweet tasting delight. Bukayo makes a great present or gift to your loved ones and friends. You can even make an extra income selling special bukayo in food shops or tourist shops. 1. Boil together buco juice, Sugar and pandan leaves until Sugar dissolves completely and mixture thickens. 2. Add vanilla extract. Remove pandan leaves. 3. Cook grated coconut in a pan with a little oil until it turns slightly brown. 4. Add syrup and thicken with a little flour or cornstarch diluted in water. 5. Keep stirring so that syrup coats the grated coconut completely, mixture thickens and bukayo gets cooked completely. 6. When cooked, transfer bukayo to a bowl. Form into small balls while hot. Use plastic wrap or wax paper to cushion your hands from the hot mixture.